I think that his Megalosaurus is following a line of hunchback depictions of the poor devil (see the two examples here: http://www.flickr.com/search/?w=84343825@N00&q=megalosaurus). I know there are many more, but poor tagging practice prevents me from finding them on Flickr, damn it. Not entirely sure where this meme got its start, but that may simply be my addled-by-first-day-of-classed brain. 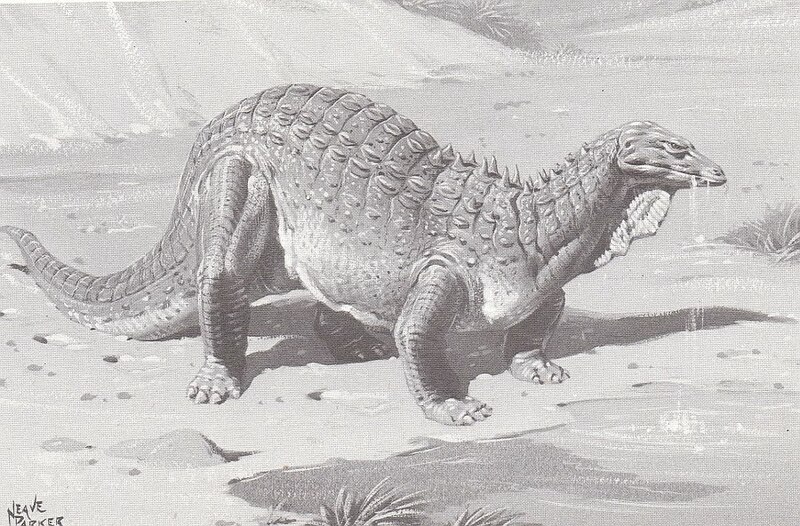 That Acanthopolis looks like an armored monitor lizard! 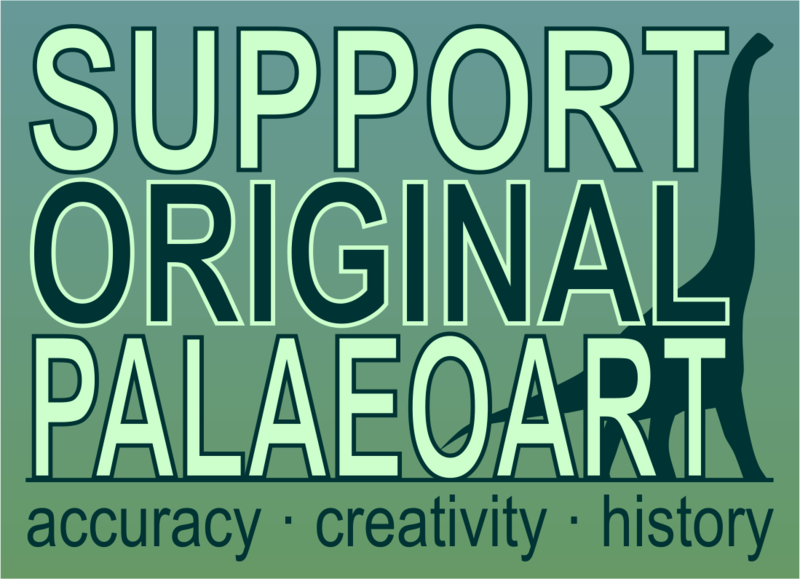 I'm fairly sure all published paleoartists have to sign a pledge to continue to depict Megalosaurus in this exact style. 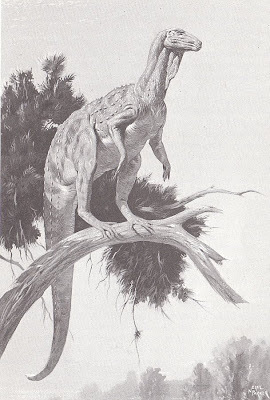 I can't count how many times I've found this guy hanging gloomily around much more modern-looking theropods. He's even in books from this century! Indeed, I've seen the stiff-necked megalosaurus hunched forward as depicted here copied almost as often as Knight's archaeopteryx-chasing Ornitholestes. The perched Hypsilophodon is also a very familiar pose. My favourite dinosaur book as a kid was from the 1950s, and featured some similarly weird ideas. 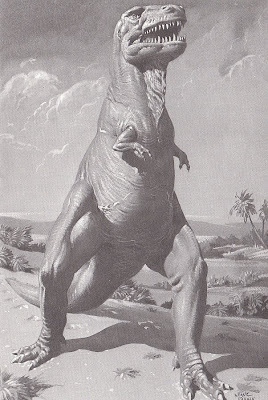 Apparently, the large size of dinosaurs was because they all had severe hyperthyroidism. 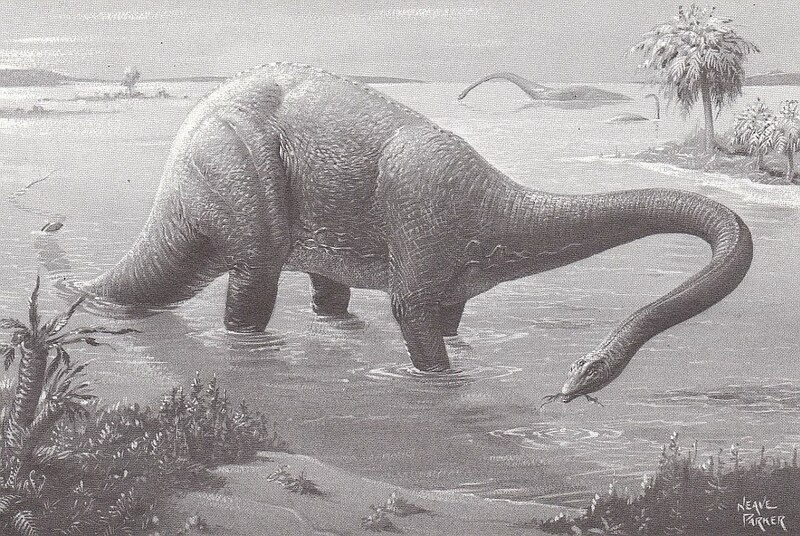 And because they were old and prone to all kinds of weird malforming, they were practically waiting for extinction to let us superior mammals rule. I wonder how that works with the thought that birds are dinosaurs? Great post - I was hoping that you might cover these images at some point. 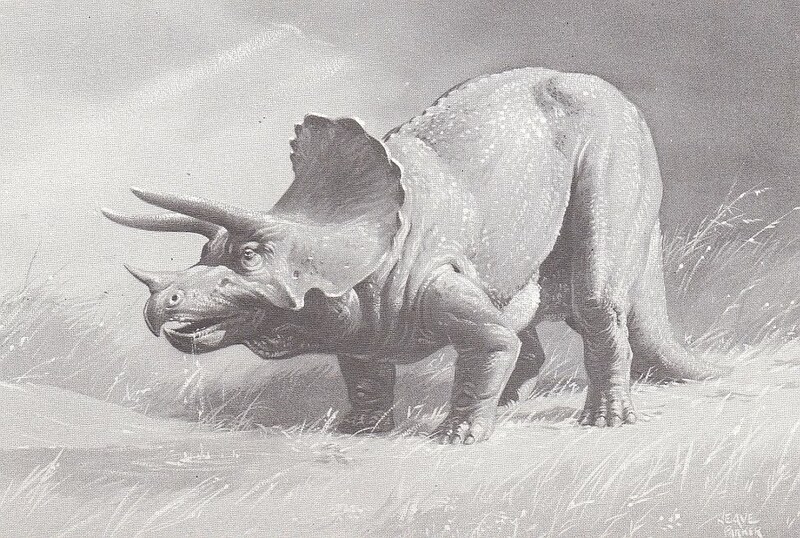 I had them as postcards from a visit to the NHM with my Grandma when I was a boy, and I only now have one left, the Triceratops which is still stuck inside the front of my copy of Evolution and Ecology of the Dinosaurs (Halstead). I really quite like these images, despite their obvious obsolescence for the most part. 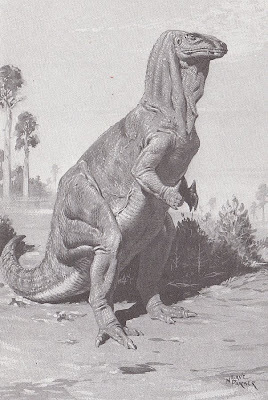 I especially enjoy the way the dinosaurs have been presented as lizard-like animals more akin to Iguanas and Monitors than birds or crocodiles. This was my first Dinosaur book! I got it when we visited the Royal Ontario Museum in 1968 when I was the ripe old age of 3 (maybe only 2 and a half). Back then there were still dinosaurs mounted in glass cases and I suppose the reason I got this book was that it was probably the only one they had in the gift shop. 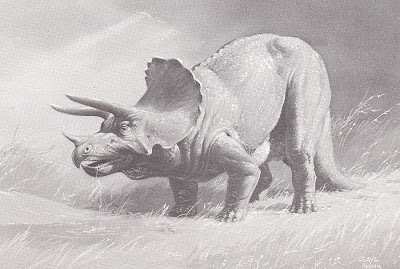 Perhaps the text was too advanced but I was immediately impressed by the illustrations, especially the triceratops. 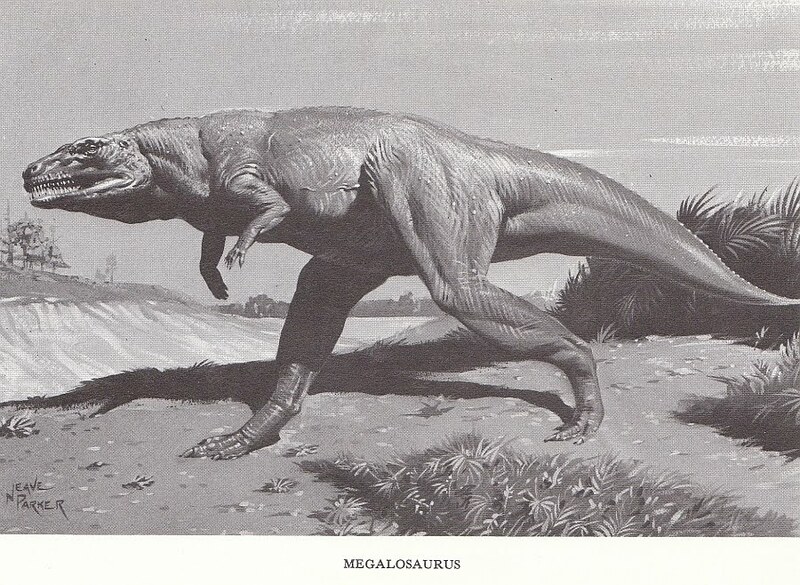 ANd the megalosaurus was the stuff of nightmares. Yes, they do look old fashioned now. But I find many modern dinosaur reconstructions too mammalian. And just try and find an adult oriented dinosaur book in a museum gift shop these days.